Training a cat is possible! When it comes to training pets, we often automatically think of dogs. Dogs can be trained to do tricks, work on farms and many other jobs but we don’t usually associate training with cats. However, using positive, reward based training and a little extra patience, your feline will surprise you with what she or he can do! To train your cat, you will first need to find something that will really motivate them. It could be their favourite treat or a game with their favourite toy. Start off with the basics and only teach one thing at a time, that way your cat won’t get confused by learning different things at once. Generally speaking, cats can to be independent and much prefer to do things in their own time — so time and persistence, on your behalf, is crucial in order to see results. And don’t forget, some cats will be more interested in training than others, as each have their own personality. Cats have the ability, just like dogs, to learn a number of commands — recalls, sit, roll over or shake a paw to name just a few. You may be accustomed to your cat approaching you only to demand food or company, but what about if you can get your cat to come to you with a command? When they are hungry and demanding food, or just before they start, call them to you using their name and a command. For example, “Milly, come!” Open a tin of food, or shake their box of dry biscuits to help get their attention as well. Gradually start extending the recall to other situations and before long, and after consistent rewards for coming to you, your cat will begin to come every time you call. 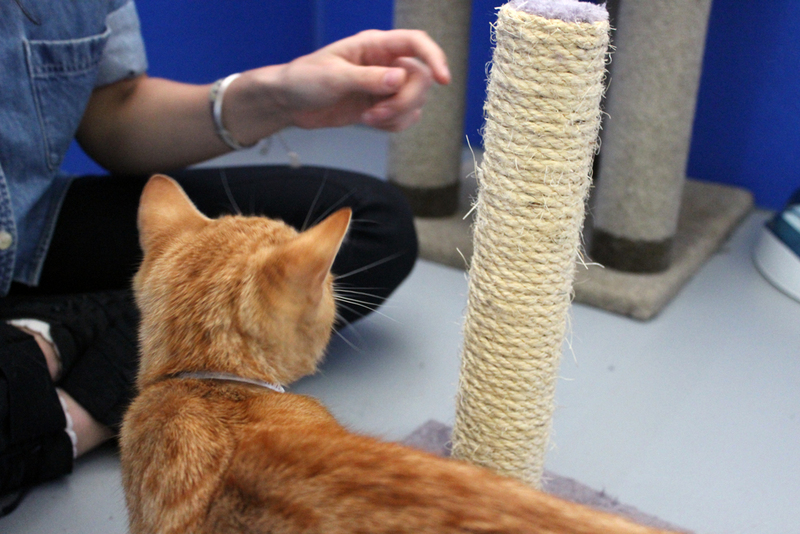 Cats will generally sit automatically, which makes teaching them to sit a breeze! As your cat goes to sit give the command “sit” and then praise and reward. Gradually your cat will begin to associate the command sit with the action and you can phase the rewards out to just praise. We’ve all seen dogs do it and it’s a very cute trick, but did you know that it’s also possible to teach your cat to ‘high-five’? When your cat is sitting in front of you, reward them for any slight lift or movement of their paw off the ground. Once your cat associates paw movement with a treat, hold one in a closed fist and when your cat uses its paw to try and grab the treat, give them a reward. Continue to reward as you lift your hand higher each time. Eventually your cat will begin targeting your hand with their paw, giving you a ‘high-five’! Start with the basics first and work with what behaviours your cat does naturally. As they get used to training move on to the more complicated tricks. Ensure you have plenty of rewards (and if using treats, make sure your cat is hungry). Find what really motivates your cat to train. Keep training sessions short, 10-15 minutes and find a quiet area with no distractions. Train regularly, consistently and always end on a positive note. Training is a great way to stimulate your cat mentally, as well as physically and will really help to enhance the bond between you.